Ain al-Hilweh (Arabic: عين الحلوة‎, lit. meaning "sweet natural spring"), also spelled as Ayn al-Hilweh and Ein al-Hilweh, is the largest Palestinian refugee camp in Lebanon. It had a population of over 70,000 Palestinian refugees but swelled to nearly 120,000, as a result of influx of refugees from Syria since 2011. The camp is located west of the village Miye ou Miye and the Mieh Mieh refugee camp, southeast of the port city of Sidon and north of Darb Es Sim. Ain al-Hilweh was established near the city of Sidon in 1948 by the International Committee of the Red Cross to accommodate refugees from Amqa, Saffuriya, Sha'ab, Taitaba, Manshieh, al-Simireh, al-Nahr, Safsaf, Hittin, al-Ras al-Ahmar, al-Tira and Tarshiha in northern Palestine. Ain Al-Hilweh is located on land that is owned by landowners from Miye ou Miye, Darb Es Sim and Sidon. Because Lebanese Armed Forces are not allowed to enter the camp Ain al-Hilweh has been called a "zone of unlaw" by the Lebanese media. Many people wanted by the Lebanese government are believed to have taken refuge in the camp as a result of the lack of Lebanese authority. The direct translation of Ain al-Hilweh is "sweet water spring". People believe that the camp was named after a natural water spring that existed in the present-day Ain al-Hilweh refugee camp. But the truth is, the Ain al-Hilweh spring was located at the corner of the valley between Miye ou Miye village and Darb es Seem. The water flowed from the spring westward 500 meters towards a man made dam. The dam was erected at the crossroad between Mieh Mieh and present day Seyroub neighborhood in Darb es Seem. The Palestinian camp is located between 1000m to 1500m to the west, away from the natural spring. Emir Fakhr-al-Din II, (Fakhr-al-Din Ibn Mann, Fakhr-al-Din al Maani), was given the title "Emir" or Prince in Arabic because the Maan dynasty reigned over Lebanon at that time. Lebanon was divided into several emirates (the state or jurisdiction of an emir). So, there was an emirate out of several called, “Emirate of Ain al-Hilweh” and had an Emir. The emirate stretched Northwest from the Ain al-Hilweh spring, looped around the bottom of Mieh Mieh village along present day Officers’ Military Club straight North to the Barghout Creek (between Mieh Mieh and Haret Saida) and West to the Mediterranean Sea. From the South, the emirate stretched straight West to the Mediterranean Sea. So the present day Palestinian refugee camp got its name from the Emirate Ain al-Hilweh. It was established in 1948 on private Lebanese land owners. The Ain al-Hilwe Palestinian camp is spread out on private properties owned by villagers from: Miye ou Miye, Darb es Sim and Sidon. The size of the Ain al-Hilwe camp in early 1990s was around 290 dunams (72 acres). Today, the size of the camp increased by 2.35 times to 686 dunams (170 acres). The proportion of the land of Ain al-Hilwe camp located in the above towns is as follows: Miye ou Miye (22%), Darb Es Sim (4%) and Sidon (74%). (...) The Refugee camps were heavily fortified, full of bunkers and fire positions. The Palestinian defence at Ein El Hilweh and other refugee camps was based on hand-carried anti-tank weapons such as the RPG (Rocket propelled grenade). (...) The IDF was not prepared for this kind of fighting, having at hand mainly armoured forces intended for use in open areas. The built-up area inhibited long-range weapons, created an equality between the tank and the RPG (often wielded by 13- or 14-year-old boys), and increased the number of Israeli casualties. (...) Palestinian resistance seriously disrupted the timetable of the planned rapid advance to Beirut. It took eight days before the final crushing of resistance in Ein El Hilweh. The method adopted by the army was to use loud-speakers to call upon the civilian population to move away, search the houses one by one, surround points of remaining active resistance and subdue them by overwhelming fire. In the 1980s, most Palestinian refugee camps in Lebanon were dominated by Syrian-backed Palestinian groups. In the late 1980s, members of Yasser Arafat's Fatah movement, after a being ousted in other refugee camps moved on to Ain al-Hilweh. After fighting a bloody three-day conflict with the Abu Nidal Organization, Fatah members were able to establish dominance in Ain al-Hilweh. However, by 1993, another group led by Fatah's top military commander in the camp, Col. Mounir Maqdah known as the Black September 13 Brigade, with support from Hezbolla and Iran, gained dominance over mainstream Fatah members in the camp. Maqdahhad's dominance was short-lived as he rejoined Fatah in 1998 after the Palestinian Authority began funding the camp again. A Lebanese court convicted the leader of Fatah in Lebanon, Sultan Abu al-Aynayn, of "forming an armed gang" and sentenced him in absentia to death. In May 2003, fighting broke out between members of Osbat al-Nour and Fatah militia members in Ain al-Hilweh after the near-fatal shooting of Osbat al-Nour leader Abdullah Shraidi on 17 May, in which one of Abdullah's bodyguards and a bystander were killed. The shooting occurred while returning from the funeral of a Fatah member and family relative, Ibrahim Shraidi who was gunned down by an unknown assailant. Roughly 200 Osbat al-Nour fundamentalist fighters attacked Fatah offices. Eight people were killed and 25 wounded in the fighting at Ain al-Hilweh. Schools in Ain al-Hilweh were shut and most stores kept their shutters down at the height of the fighting, which provoked an exodus by hundreds of camp residents. Two months after the ambush Abdullah Shraidi died from wounds received during the attack. Fatah agreed to a ceasefire after failing to defeat the fundamentalists in the camp. In July 2005 four members of the Islamic Liberation Party were arrested. The Lebanese authorities claimed that the group had connections with Syria and that the group has participated in terrorist attacks in various Arab countries. Palestinian sources described the moves as a step toward the disarmament of their factions, in line with United Nations Security Council Resolution 1559. 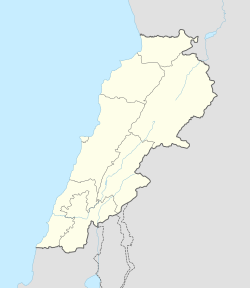 On 3 June 2007, Jund al-Sham fired a rocket-propelled grenade at a Lebanese Army checkpoint near Sidon, prompting a response from the Lebanese Army leading to clashes in the camp. These clashes follow a tense three weeks in Lebanon's north, where the Lebanese Army has been battling militant group Fatah al-Islam at the Palestinian refugee camp Nahr al-Bared. In March 2008, fighting broke out between members of the Fatah faction and the Islamist group Jund al-Sham. The conditions in the camp have been exacerbated by an influx of previously Syrian-based Palestinian refugees, as a result of the Syrian Civil War. As a result of this influx, the camp's population has swelled from 70,000 to as much as 120,000. As of 2014, the camp suspected of being a popular destination for jihadist rebels fleeing neighbouring Syria, particularly after the Syrian Army, backed by the Shia Lebanese militia Hezbollah, regained control of Yabroud from the rebels in March 2014. In 2016 Lebanese authorities began constructing a concrete wall with watch towers around the camp. The wall has faced some criticism, being called "racist" by some and supposedly labeling residents as terrorists or islamists. As of May 2017 the wall construction is nearly complete. ^ "Originally built in 1948 for 20,000 people, camp officials now put the figure at 120,000 residents, with each apartment on the 1,500 square-metre site hosting four to six families." ^ "UNRWA - United Nations Relief and Works Agency for Palestine Refugees in the Near East". UNRWA. Retrieved 20 November 2014. ^ "[Imc-beirut] Daily Star: Army beefs up security at Ain al-Hilweh". Archived from the original on 13 March 2007. Retrieved 7 September 2006. ^ James Ron, Frontiers and ghettos: state violence in Serbia and Israel, University of California Press, 2003, p.178. ^ גלעד בארי, מלחמת לבנון - נגד פלסטין הקטנה Gil'ad Be'eri, "The Lebanon War" - "Confronting "Little Palestine" in Lebanon" at . Archived 2009-10-24. ^ a b c "Variolamajor.com". Archived from the original on 10 March 2007. Retrieved 20 November 2014. ^ a b "Impact of Syrian unrest on Ain Al-Hilweh camp". Middle East Monitor - The Latest from the Middle East. Retrieved 20 November 2014.